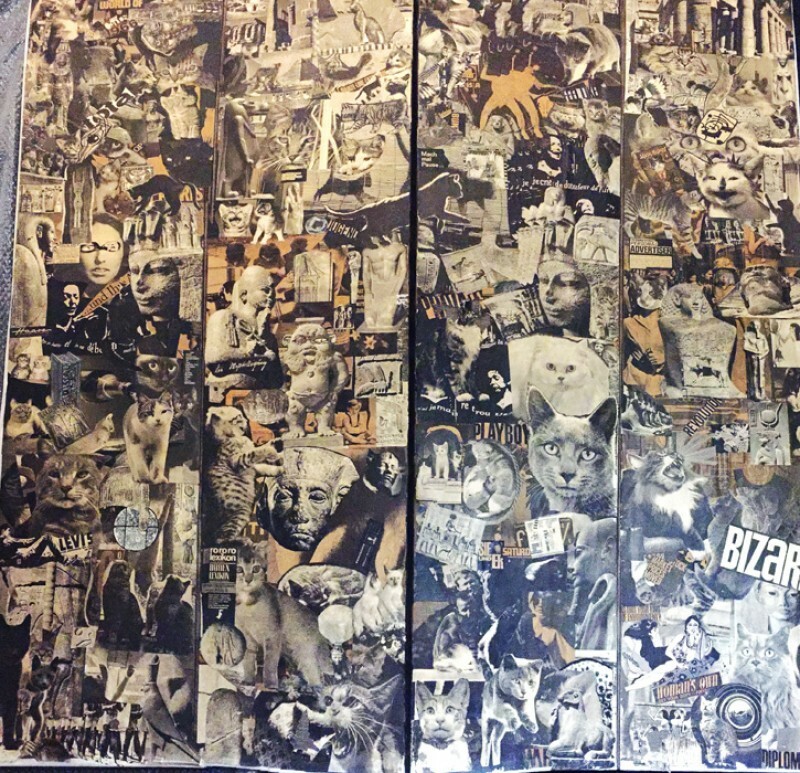 Kenneth Halliwell’s 1966 collage World of Cats is the main attraction of the new Islington Museum’s 'Islington’s Pride: an archive for the future' exhibition. In 1967 Halliwell murdered his partner, the playwright, Joe Orton and then committed suicide. In that same year homosexuality was decriminalised within the United Kingdom. The exhibition is a celebration of this legal change and of local LGBT artists. Halliwell’s life and work is often understood in relation to his relationship with Orton. Indeed when the screen was sold at charity auction it was attributed as 'the Orton, Halliwell screen'. It is impossible to consider the collage in terms of Halliwell alone within the context of this exhibition. The screen is an example of a local homosexual man’s art: a man who lived with Joe Orton. Halliwell believed Orton’s achievements were due to their joint efforts. Their humour; success, failures and the violence of their deaths; all form a tragic collage of events. Orton is an inescapable factor when viewing Halliwell’s screen, the screen raises questions about their relationship but this is still Halliwell’s collage. Halliwell felt awkward and insecure about his relationship with Orton and with his sexuality. The fear of prison was a constant and very real threat to him and other homosexuals. By 1966, he and Orton had already experienced prison, with convictions of crimes committed against, ironically, the Islington Council Library, which is situated above where the screen is today in the museum. 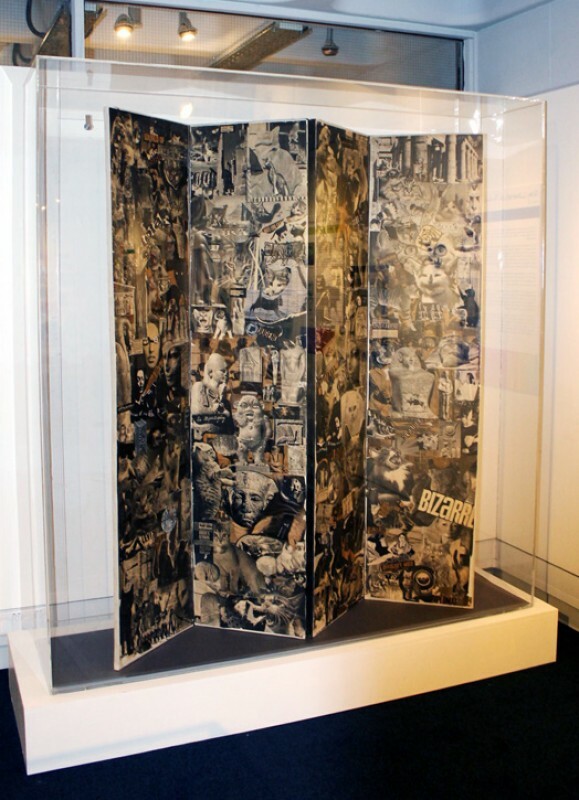 In 1962 they were imprisoned for the theft and defacement of 72 books, they substituted the plain dust jackets of library books with their own text and racy book cover collages. Orton believed prison invigorated him, however it left Halliwell eviscerated. Their subversive collages were a root cause of his traumatic jail term yet he continued to make them. Their home in Noel Road, Islington was covered with collages as evidenced by many of the photographs of its interior. The World of Cats is the largest remaining Halliwell collage, it was arranged upon an ordinary 1960s four fold screen with a faux wood patterned paper back. The black and white of the magazine cut-outs dominate but have been interspersed with some in orange. Akin to its materials the screen is a contrast of the exotic with the mundane, with various cats, adverts and ancient Egyptian monuments. Deified cats are present along with absurd images, such as a ‘Mein Kampf’ feline in a Nazi uniform. Halliwell’s screen could be interpreted as being more than a playful mosaic of cats. Notably a black cat positioned across both of the middle two parts of the screen is sole image that breaks across the borders; crossing territories. The remaining images are all restricted to the boundaries of each section. With this and the exhibition’s theme in mind, the choice of the cat theme is an intriguing one. Visitors to the exhibition can share and pinpoint with post-it notes, places with gay cultural associations on a map of the local area. The map has been annotated with reference points to areas where 'Orton cottaged' or 'cruised' and serves as further evidence of Orton’s cat like roaming behaviour. He strayed from home and Halliwell, taking what he could get, like the black cat crossing the middle two screens who will not be restricted to one location or keeper; a cat on the prowl for other felines. With this map of Orton’s promiscuity and the notoriety of their lives and deaths, it is now Halliwell’s collage that is the centre of attention. 'Islington’s Pride: an archive for the future' is open until 16th March 2017.